From February 9th to February 11th, 2015, Kumamoto University delegates from the International Affairs Division, led by Mr. Fukumura, went to the United States to visit three universities in Montana. The group visited Montana State University, Carroll College, and the University of Montana, which are partnered with either Kumamoto University or Kumamoto Prefecture, for the purpose of expanding both student exchange programs and overseas training programs for university officials. In the meeting with Teresa Branch, Vice President for Student Affairs at the University of Montana, the group learned about topics such as the higher education system in American universities and current exchange activities in Montana with Japanese universities. The delegates from Kumamoto University introduced their school and spoke about topics such as the goals of the Top Global University Project. They received valuable suggestions from the consuls for promoting inter-university exchange with universities in Montana, and achieved substantial results. This visit will serve as a turning point to further advance both student and academic exchange between Kumamoto University and universities in Montana, as well as with other institutes of higher education in the United States. 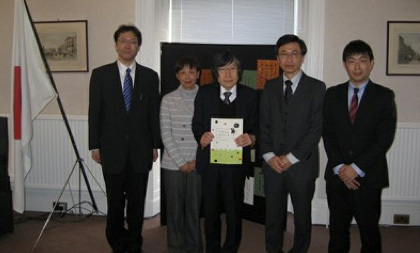 On January 13, 2015, a delegation from Kumamoto University led by Lecturer Mariko Masden of the Center for Globalization visited the Japanese Consulate-General in Edinburgh, located in Edinburgh City, Scotland in the UK, and paid a courtesy call on Consul General Hajime Kitaoka. The delegation went to the UK to expand international exchange between universities in Scotland and Kumamoto University and develop student exchange programs and overseas training programs for university officials in Scotland. The delegation visited the University of Edinburgh, the University of Strathclyde, and the Japanese Consulate-General in Edinburgh. In a meeting, Consul General Hajime Kitaoka and Vice-Consul Kengo Sawai explained the recent situation of higher education in Scotland and the activities of Japanese universities and Japanese-affiliated companies there. Meanwhile, delegation members introduced about academic and student exchange between universities in the UK and Kumamoto University, and provided an outline of Kumamoto Prefecture. They received valuable suggestions from the consuls for promoting inter-university exchange with universities in the UK, and achieved substantial results. This visit is expected to promote international student and academic exchange between Kumamoto University and higher education institutions in the UK including Scotland. 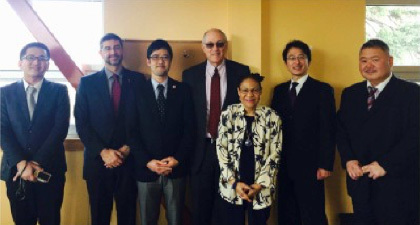 On February 23, 2015, a delegation from Kumamoto University visited De La Salle University in the Philippines. Founded in 1911 as a Catholic university, De La Salle University in Manila, Luzon Island, is one of the leading private universities in the country. There are roughly 17,000 undergraduate and graduate students enrolled in its 8 colleges and schools. It provides education under the philosophy of peace and harmony based on Christianity. This internationally-minded university has many partner universities around the world, and actively promotes exchanges between researchers from various countries, not to mention exchanges between students. In the QS Top University Subject Rankings 2013, De La Salle University’s English language and literature education was acclaimed as being among the world’s top 100, which is the highest level of education standards in the country. 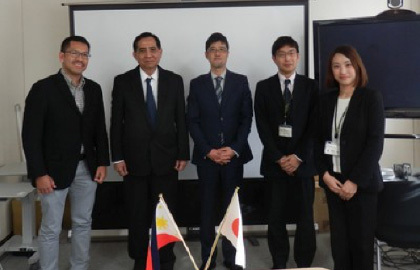 Kumamoto University’s Faculty of Engineering and the Graduate School of Science and Technology concluded a department-level exchange agreement with De La Salle’s College of Engineering in 2011. Since then, the two universities have deepened exchanges mainly in the area of engineering. From Kumamoto University, Professor Tetsuya Kida and Assistant Professor Armando T. Quitain of the Department of Applied Chemistry and Biochemistry, Faculty of Engineering, and officials from International Affairs Division paid a courtesy call on Dr. Alvin Culaba, Executive Director for External Relations and Internationalization. 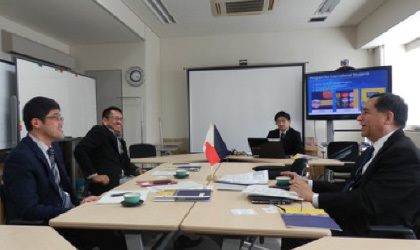 After listening to an introduction of De La Salle University, the delegation members delivered a presentation including an overview, research achievements, international programs at Kumamoto University, and the activities of the ASEAN University Network through the Six Universities Network/International Education & Research System, Japan (SUN/SixERS). Following this, the delegation members exchanged views with Dr. Rosemary Seva, Dean of the College of Engineering, and other people in the college about the possibility of upgrading the relationship to a university-level exchange, and of introducing a credit transfer program to the area of applied chemistry and biochemistry. In 2016, it will be five years since the department-level exchange agreement was concluded, and the delegation members felt it was time to make deeper ties. 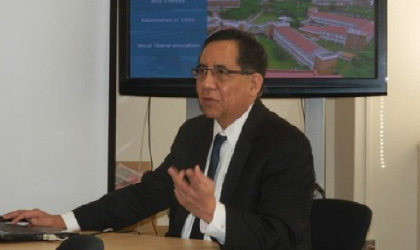 The two universities agreed to continuously develop their successful relationship. Following this opening, it is expected that student and academic exchanges will be further promoted between Kumamoto University and De La Salle University and other institutions of higher education in the Philippines as well.